The range of habitats and diversity of wild flowers across the Common makes it a fine home for many species of invertebrates, reptiles, birds and mammals. The invertebrate population is very diverse. 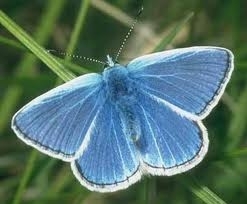 You may see species of butterflies and moths that thrive in chalk, flower-rich grassland, such as the dark green fritillary, common blue (bottom left) and burnet moths. There are snails to be found too, such as the heath snail Helicella itala, and spiders such as the funnel-web spider Agelena labyrinthica and, just off the Common, the very rare purseweb spider Atypus affinis. A particularly notable find in the summer of 2010 was the small bug Hallodapus montadonii (bottom right), which had not been seen in Gloucestershire since 1944! Read more. The Common is home to four species of reptile: Adder (bottom left), Grass Snake, Common Lizard and Slow Worm (bottom right). All these species are protected and we are working to monitor their numbers and conserve their habitat. 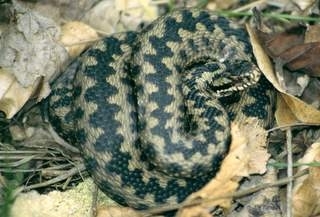 Adders begin to emerge from winter hibernation once the weather warms up in the spring. On sunny days (especially in the mornings), they like to bask in the sun on rocks and in tussocky grass. Bird life is plentiful. At most times of year skylarks (bottom right) can be seen and heard overhead. Other species seen in numbers include meadow pipit, finches, linnet, woodpigeon, yellowhammer, fieldfare, rook and jackdaw. You may see a buzzard or kestrel circling above, seeking out its prey. Rarer visitors to the Common in recent years have included the ring ouzel (bottom left), stonechat, wheatear and great grey shrike. A local ornithologist carries out monthly bird surveys and produces a comprehensive annual report of his findings. There are rabbits in abundance, especially in the sandy areas on the hilltop and some of the disused quarries, and a few hares (below left). Colonies of bats ((lesser horseshoe and Myotis species) inhabit some of the rock faces. Increasing numbers of deer forage in the fringes of the Common: most are roe deer (below right) or the diminutive but noisy muntjac. Grey squirrels are abundant in the woodlands. There are four badger setts on the Common itself and two more a short distance away. You might also catch sight of the occasional fox, stoat, weasel, hare, shrew or mole. All of this wildlife ultimately depends on the diversity of the grassland. Without grazing and other forms of management, natural succession would proceed: rough grass varieties such as tor grass would take over, stifling other types of grass, herbs and flowers. Gorse and hawthorn scrub would spread and the rich variety of wildlife would be gone - and very difficult to restore.